No more excuses. If you haven’t thought about taking your children to Barcelona, Spain, it’s time. Not only should you consider taking them there, but I’m also even considering moving there and settling down for a while. Sound crazy? Why would a single father move to Barcelona with his daughter? 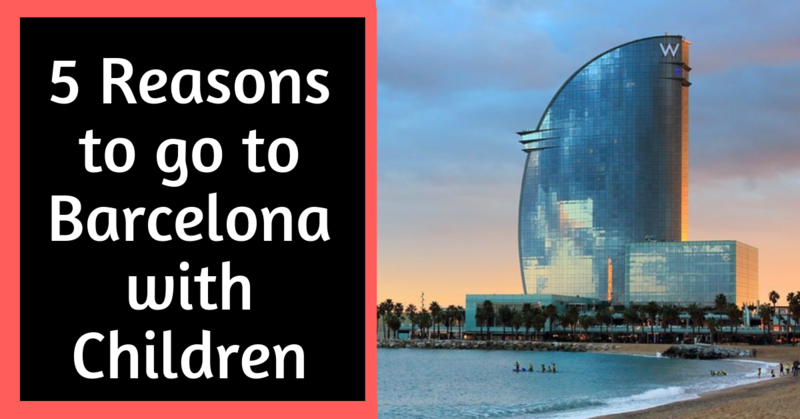 Here are five reasons why you should consider taking your children to Barcelona, Spain. For children, learning a new language can be difficult, frustrating, and, at times, isolating. I’ve seen my daughter go through the pains of learning Cantonese in Pre-K. For the first few months, she felt alone at school and would tell me that no one talks to her. I would remind her that people are talking to her, she just couldn’t understand it yet and to just keep listening. She did. By the fourth month, she started to show a pretty solid understanding of the context of the conversation in Cantonese around her, she was even speaking a few words here and there! In the sixth month, over the course of 12 days, her language exploded. She went from phrases to sentences to run-on sentences in less than a month. Her progress has never faltered. But we’re not in Hong Kong right now, we’re in Barcelona. She hears Spanish with me and at school, of course. It’s no surprise that living in Spain gives children the chance to learn Spanish. But, it also gives them the chance to learn another language. In the case of Barcelona and the surrounding area, the local language is Catalan. I don’t speak it, but it sounds a bit like a blend of French, Spanish, and Italian with its own unique sounds. There are other unique languages in Spain as well, such as the Basque language, but in Barcelona, children have the opportunity to learn more than one new language. 2. A Friendly Population That ISN’T Touchy! For any parent travel blogger who has blogged about traveling in some parts of Asia, there is a concensus that some cultures are way too touchy. We smile and act polite, but inside we want to scream when a stranger pets the face of our child, rubs their head, or squeezes both their cheeks. Why must they be so touchy? Oh well, that’s a part of travel I suppose. Spain is a great option for travel families because the Spanish people are super polite and friendly, but they also aren’t touchy with your children. I’ve been here over a month and not one stranger has touched my child. It feels like a great weight of daily annoyance has been lifted. Thank you, people of Barcelona, for not randomly touching my daughter. I never was a coffee person. That was until I became a single parent. Now I’m about 41% coffee. Spain keeps my homeostasis in balance with high dosages of caffeine for very few euros. Coffee and croissant shops are ubiquitous, delicious, and seem to always be busy. If you’re not a coffee person already, it’s also a good place to become one. The coffee in Spain isn’t overwhelming like a cup of Vietnamese coffee, but it’s potent and tasty enough to be a little addictive. Coffee is often served with some type of bread: baguette, roll, donut, or similar. Parents unite! Around the coffee in Spain. Just another great reason to take your children to Barcelona. The Mediterranean is super salty. In a good way. I love salty sea air, it’s almost as good as jungle mountain air. The way the waves break along the multiple beaches in Barcelona, there can simultaneously be calm places to swim and others to surf a decent wave. It’s a great place for water sports and the beaches are massive. For people with children who need sunscreen, bring some. There aren’t many places for cover on the beach. But the sand is soft and the water cool. One of the best things you can do with your children in Barcelona is take them to one of the beaches, doesn’t really matter which one. But, the beach nearest Hospital Del Mar has a large climbing structure that children and adults seem to enjoy. Plus, bring some potatoes to dip in the salty sea, I hear monkeys do it on some remote island. I’ve never been a big fan of architecture, but I grew up in an area where the architecture was the forest around my house, the gas station 10 miles away, and the grocery store was very rectangular. Not a lot to see. Then I got to Barcelona. Even from the sky, the city looks beautiful. Its distinct roads carving their ways in odd directions through separate barrios make it look like a painting from above. Street level is even more impressive. Some of the most common buildings downtown are more beautiful than any buildings I’ve seen in my life. It’s no wonder that Europeans have a much more refined sense of style than me and my fellow Americans, we’ve been living near architectural manure our whole lives! It’s obvious to anyone who’s been to Barcelona, but this dude Gaudi built some wild buildings. You’ve got to take your children to Barcelona to see the architecture, it’s wild. I said wild twice. That’s how serious I am about this. Subscribe below to my email list below if you liked this writing, you might like what you get.